Gangwon Province Gov. 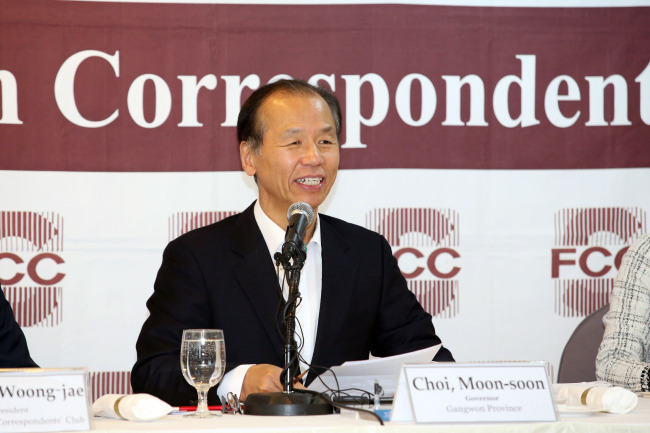 Choi Moon-Soon said Tuesday that North Korea will get sanctions relief for the resumption of two key inter-Korean economic projects -- the Kaesong industrial complex and Kumgangsan tours -- as its nuclear talks with the US are making progress. “After the Olympics, I visited North Korea three times, and I’m quite convinced now that North Korea will become a sole and successful case of denuclearization in the world,” he told reporters during a press conference in Seoul. His remarks came as the province has pledged to make inter-Korean peace its top priority this year and accelerate inter-Korean economic and cultural exchanges. Gangwon Province, which borders North Korea, is trying to maintain the momentum it gained by hosting the 2018 PyeongChang Winter Olympics during which athletes from North and South Korea marched under the Korean Unification Flag. The inter-Korean thaw led to a summit between South Korean President Moon Jae-in and North Korean leader Kim Jong-un in April last year. “We are very proud that that there has been significant progress in inter-Korean relations and peace on the Korean Peninsula since the Winter Olympics,” Choi said. The reopening of the industrial park in the North’s border town of Kaesong and the tourism program to Kumgangsan in the North are believed to have been discussed in negotiations between Washington and Pyongyang in exchange for giving up nuclear warheads and materials, he said. To prepare for the resumption of Kumgangsan tours, Gangwon Province and Goseong County will improve tourist facilities in the Goseong area and develop tourism products. The Gangwon Provincial Office will hold “Again PyeongChang,” an event to celebrate the one-year anniversary of the 2018 PyeongChang Winter Olympics and Paralympic Games, from Feb. 7 to 17, amid a mood of reconciliation with Pyongyang. Reflecting the main theme of the event, “creating a message of peace,” there will be several joint programs by the two Koreas, including a joint taekwondo demonstration, a women’s ice hockey friendly match, and the “Peace Concert,” during which the folk song “Arirang” from the South and North will be performed by singers from the two countries. “Gangwon Province sent an invitation to the teams through the joint liaison office in Kaesong and is waiting for a response from the North Korean authorities,” Choi said. The province has been pursuing sports exchanges with the North, and the two Koreas will participate in a youth soccer friendly match that kicks off Wednesday in Kunming, China.